Three ravers who were out scouting for locations in Montreal North fell on hard times earlier this week when the floor of the decrepit, abandoned building they were in collapsed beneath their feet. Bones were broken, blood was spilled, and bruises were made, but thankfully none of the injuries were life threatening. 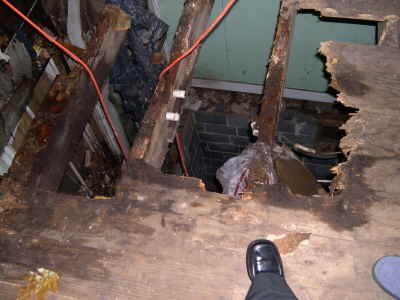 Our hapless trio of urban explorers dropped eleven feet before crashing on to a clean patch of wood flooring. They were lucky the floor gave out where it did -- their landing area was only five feet away from a large pile of rusty iron bars, which almost certainly would have made their fall lethal. One of the ravers escaped relatively unscathed, and had the pleasure of calling 911 to get assistance for his friends. Neither the police nor the paramedics were impressed with our intrepid adventurers. The boys were brought to a hospital and once their wounds were treated, charged with trespassing. Adding insult to injury, they also had to pay for their ambulance ride. The lesson here, kids? The people bringing you these parties often put their life at risk -- and all in order to give you guys a chance to engage in a primitive mating ritual involving copious amounts of intoxicating substances, loud music, and outrageous displays of sexual availability. People are falling through floors to help you get your rocks off, and that's something you should all appreciate. Hug your local promoter. They're doing this for you.